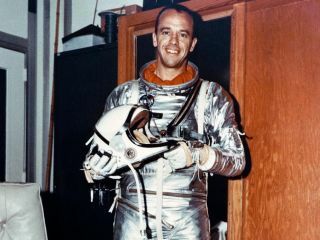 Astronaut Alan Shepard, the first American in space, poses here in his Mercury flight suit. On May 5, 1961, astronaut Alan Shepard launched on a 15-minute suborbital flight aboard the Freedom 7 spacecraft, becoming the first American to reach space. SPACE.com: Why did NASA pick Shepard to make the country's first human spaceflight? Why was he the guy, out of all the test pilots NASA looked at for the Mercury program? Neal Thompson, author of "Light This Candle: The Life and Times of Alan Shepard." Neal Thompson: I think Shepard just had a little extra. They were all obviously elite aviators and exceptional men on a lot of levels. But I think because there was so much at stake at that time, I think they picked who they felt was the least likely to screw up -- the one that they could trust to handle any situation that came his way. SPACE.com: Did NASA take into account how Shepard would perform as an ambassador for the space program and the country? Did any of that come into play in the decision? Thompson: I think it absolutely had to. They knew that whoever they chose, that decision was going to send a message. And so I think part of that message was, "Here's the face of the astronaut program. Here's the type of guy who represents who we are and what it is we're trying to do." And I think that was a tricky thing, because Shepard wasn't the friendliest media personality at that time. I think that's one reason that John Glenn, later on, became chummier with the press and ended up becoming more of the recognizable face of the space program -- because he was a little more Boy Scout and apple pie. SPACE.com: Do you know anything about Shepard's mindset going into the flight? Was he nervous? Thompson: I don't think you could say he was nervous. It's more accurate to say he was anxious and eager. He exuded nothing but confidence. So I think his feelings going into the flight were, "Let's do this thing." That's why I think his famous quote kind of sums up his personality: "Light this candle." And I think he was a little bit frustrated with NASA for, in his mind, being a little bit overly cautious. He was a little bit pissed off that they delayed it so much that the Russians were able to get up there first. In the book, I have a quote from him that says, "We had 'em by the short hairs." We were poised to be first, and we blew it. SPACE.com: So he was frustrated that Gagarin beat him into space? That mattered quite a bit to him? SPACE.com: Did Shepard's disappointment fade over time? Did he reconcile himself to the fact, for example, that the Soviet victory really helped jump-start the U.S. space program in a lot of ways? Thompson: I think he did feel that, but then there was another turning point in the mid-60s where he felt like the program got even more back on track. That was after the Apollo 1 fire [in 1967], which was really devastating to him -- to have lost Gus Grissom in particular, and the other two [astronauts] as well. But because Gus was with him from the beginning [as part of NASA's original Mercury Seven astronaut class], I think that was really difficult for him. In the book, I describe a speech that he gave where he became very emotional and talked about the fiire. He kind of issued a rallying cry -- like, "Let's get beyond it. Let's learn from this. Let's get the program back on track, fix the problems that need to be fixed, and let's get the program moving forward again." I think he felt like that was a moment where he could play a role in advancing the program, just as responding to the defeat by the Soviets with the first flight motivated the program to move forward as well. SPACE.com: After his suborbital flight, Shepard was grounded for years by an inner-ear disorder. But he came back and, in 1971, became the fifth person to land on the moon as part of the Apollo 14 mission. So it was really devastating to him when he got hit with this inner-ear disorder, called Meniere's Disease. And it was especially bizarre for a guy like Shepard, because the effects of this disease gave him vertigo and nausea. Sometimes he would wake up in the morning and just fall out of bed, because the room would be spinning. And he'd spend an hour at the toilet throwing up because he was so dizzy. So for a guy who viewed himself as one of the best test pilots in the world -- suddenly he couldn't even fly a plane, let alone a spaceship. SPACE.com: That's sort of a cruel joke played on him, by fate, or nature, or God or whatever. Thompson: Yeah. After that point, he could have said, "OK, I'm done, I'm washed up. I'll go into business or politics," because there were offers on both fronts. But he decided to stick with the program and play a much more modest and humbling role as kind of an administrator. He for a while was head of the Astronaut Office. For the guy who was selected to go first to suddenly be taking care of the next groups of astronauts, to watch them go into space -- this had to be really difficult. But he stuck with it. He got his ear disorder fixed through experimental surgery and got himself right back in the flight rotation, and sort of elbowed his way ahead of some other guys and got himself assigned to Apollo 14. To be able to achieve that -- I think it's a reflection of his determination and his drive and his competitiveness. SPACE.com: Which of his two big spaceflight achievements was he more proud of, or did he derive more satisfaction from? Thompson: I think probably he took the most [satisfaction] from -- at least professionally -- his Mercury flight, because he was chosen to be the first American to go into space. That was hugely satisfying to him. On a personal level, the moon flight was special to him, because of that long fight back from his disease. And he did talk briefly once of having a minute there on the moon just before he had to leave, and getting a little choked up and teary-eyed, looking up at the Earth and thinking about how far he's come, literally and personally, to get there. SPACE.com: Was he one of those guys who was always looking back at his glory days, or did he find a lot of peace and satisfaction in his life post-NASA? Thompson: I think absolutely the latter. And again, that's one of the things that impressed me about him, and one reason I felt like his story was unique compared to some of the other guys, who did look back. Many of us read about or heard about the struggles that some of the astronauts had after their days as astronauts. Buzz Aldrin has written about it and spoken about it at length -- about his depression, his alcoholism. I've interviewed other guys who told me other astronauts thought to themselves, "Well, now what? I've gone as far and high as a man can go; I've accomplished this goal that had been my life's work. What am I going to do with the rest of my life?" And I think that question was a tricky one for a lot of the astronauts but not so tricky for Shepard, who just plowed ahead. He just kept busy. He became, according to most of the astronauts, the first millionaire astronaut, because he was very successful in business. He was just sort of exuberant in everything he did and pretty much successful in everything he did. So I think he had a happy rest of his life after that. He loved to play golf, he loved to travel, he loved to meet friends. He was a guy who enjoyed life and lived a big life. SPACE.com: What about his legacy? Obviously he has a big one as the first American in space and the fifth person to walk on the moon. But has he affected the nation or NASA in other ways? Thompson: I feel like there is something else that he sort of represented. And it goes back to what I focus on a lot in the book, which is this difference between guys like him and guys like John Glenn -- John Glenn being the Boy Scout, the altar boy, the freckle-faced All-American kid. But I think what Shepard represented was kind of different. He was the fighter jock, he was the badass, he was the bad boy. He was stylish, he was funny, he flirted with women. He was like Don Draper in a spacesuit. He represented this "Mad Men" era -- this cool, hip, martini-drinking, cigar-smoking bad-boy astronaut fighter jock. And I think that has lasted. He really represented that, and helped that idea of that type of American male become more a part of the American consciousness.